Yes, this was rather special to me as believe it or not, it was where I was trained. Couldn’t believe it when I found it like this. This place holds a lot of fond and important memories. I even found exam papers in the tunnels from my time there. I could have found my own exam papers (and thus changing my marks). Lots of specimens simply lying around. Also got up the tower which offers amazing views across the most pretty part of the Thames. Had to buy a tree at a nursery nearby. Given I just had my new lens delivered, I thought it would be rude not to try it out in this convenient little popular spot. Visited alone, which always makes for a more heightened experience as I am bit of a nervous one. I'm always fascinated with the medical stuff. 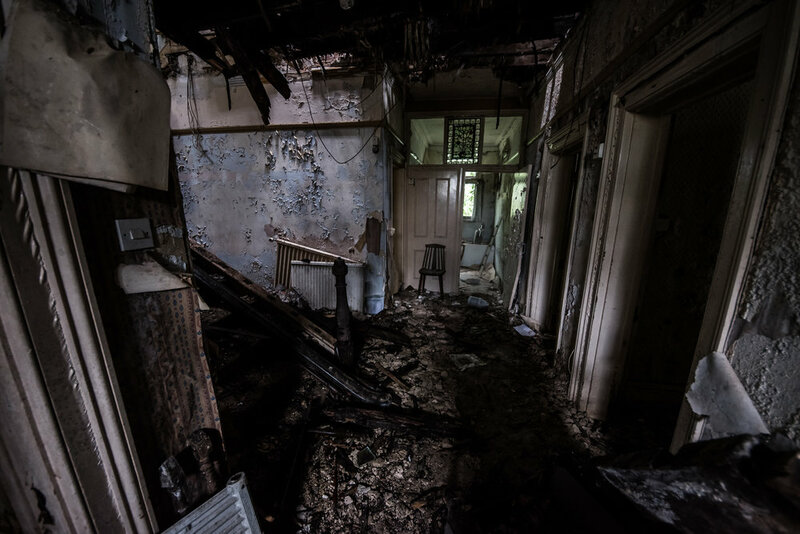 So much has gone on in places like this and mixing the historical emotion of these places with the decay and current isolation, they are full of atmosphere. This is a pelasant little building that is great for a 30min wander and it is full of light making it a real pleasure to photo. 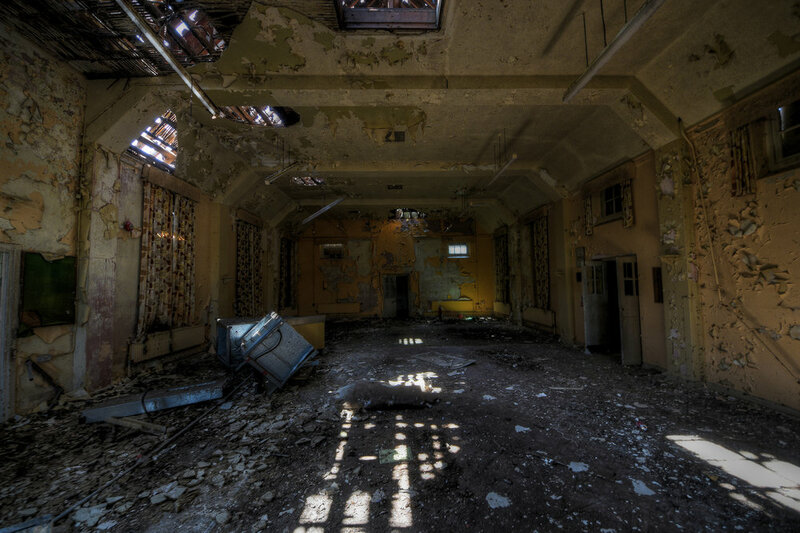 Originally St. Peter’s Hospital was built to serve casualties of the Second World War. The mortuary was built in the 1940's on the edge of the site. Apocalypse levels of destruction and decay here with only a few remnants of its past function visible. Amazing to see ward diaries from the 80s lying around. Mr security was hot on my heels here, but I was able to keep piles of rubble between me and his minces at all times…..
Set in a lovely rural location, this is one place I think really does need to be demolished. Here are some photos I discovered I hadn’t sorted on a revisit to this animal research facility. Another one sadly since bulldozed. This was a very interesting place. 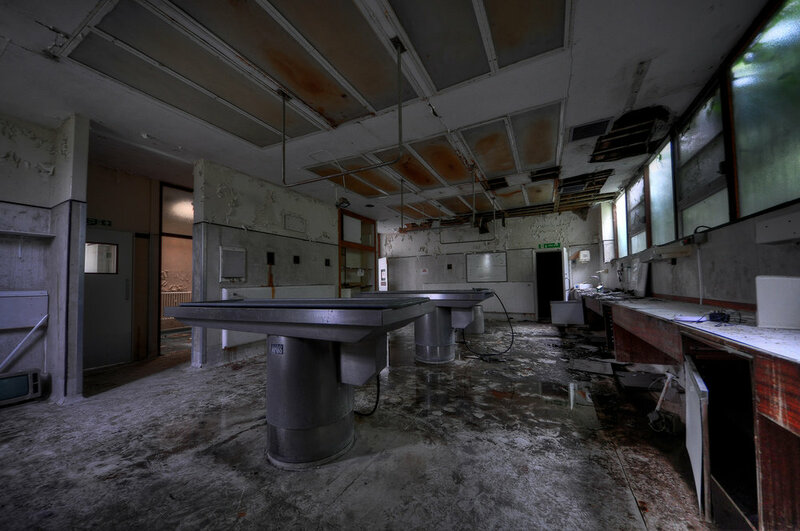 The main lab area was claustrophobic and secretive. Frosted glass blocks to stop prying eyes seeing the experiments going on inside. I’ve included here a couple of pieces of research work done here, including submerging dogs into icey water to see how long they lasted and stopping dogs hearts and seeing if they could use a mechanical external heart. All interesting but somewhat gruesome reading. There is also a resident monkey who had a tattoo put on his head. This was a picture taken by animal rights protesters who invaded the joint at one point. This place had a lot of atmosphere. Then there were the wierd rooms filled with random stuff, some musem stuff and then a large collection of personal belongings, it was a bizarre find in a place like this. Then there is the old manor house. This was again rather contrasting to the whole purpose of the place. I really enjoyed exploring this place and am sad that it is gone. 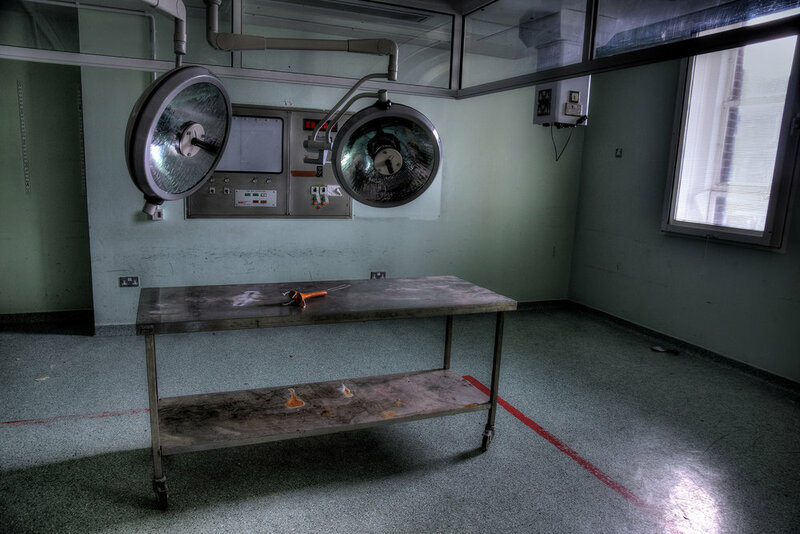 Down in the fresh sea air rots this hospital, with quite a few relics left behind. Sadly couldn’t get into the padded cell room of the psychiatric block-I’ll probably have to go back! This place was a solo explore. It was a dark, wet, miserable day and when I finally hacked through the shrubs to get to this house, I felt rather intimidated looking in through the window. It was very dark inside and there was a lot of creaking and noises coming from the place. It was quite sinister inside. I can’t really capture what it was like in the photos. A real deathtrap….. I resisted crossing the dodgiest areas of the first floor to get to the other bedrooms. Our Cambridge home is both friendly and well managed where we respond to the needs of each of our residents with courtesy and dignity at all times.From the moment of arrival at our Cambridgeshire home you will receive a warm welcome from both staff & management.Our home is tastefully decorated, and furnished to provide a level of comfort that is much appreciated by all.We have setup a rota system that ensures we have nursing care staff on duty all day and night.There is also a 24-hour call system installed that enables our residents to call a member of staff at a moments notice.